As planning season for many clients and agencies is well under-way, the chatter of the “perfect media mix” overtakes most strategy meetings. But what pieces are decisively interlocked to create this complex puzzle that is the media plan? Television for the broad reach and awareness aspect? Check. Digital for that added layer of quantifiable metrics? Check. A sprinkling of print to hit that elusive niche audience? Check. Commonly, outdoor advertising is an afterthought to many media plans, utilized as just an additional awareness tactic during peak season or a directional piece to point hungry travelers to an exit that hosts their favorite chicken sandwich. Now, not to say there is not an important place for this approach, but the way that OOH has evolved in the past decade lends itself to be so much more than just a line item on a flowchart. 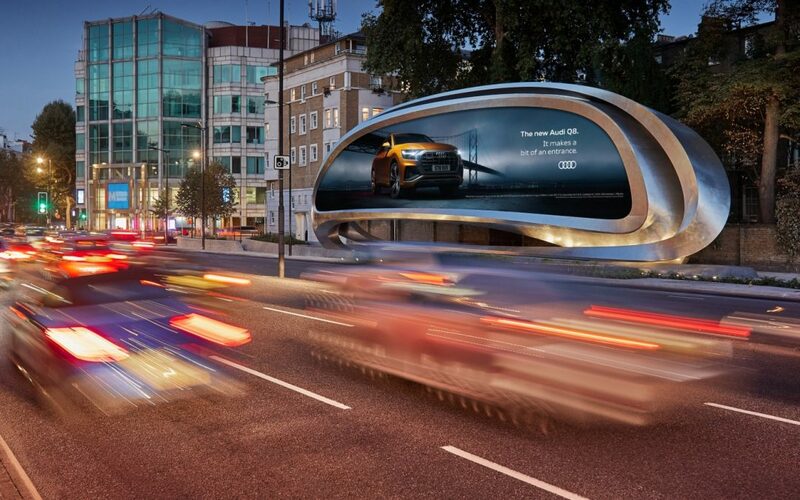 Recently, one of the leaders in OOH innovation, JCDecaux, partnered with Zaha Hadid Architects to put a more contemporary twist on the traditional billboard. This marked the first time the company has ventured outside of their industry for a partnership and served as the debut billboard for Zaha Hadid. The unit, more aptly termed a sculptural fixture, stands approximately 30 feet tall and 98 feet wide boasting a high-resolution 8mm pixel pitch screen as well as integrated lighting for pedestrians due to its London center locale. Senior Associate at Zaha Hadid, Melodie Leung stated, “Both a civic gesture and a promotional medium, the intertwined, looped ribbon design expresses the dynamism of pedestrian and vehicle traffic movements that intersect at this important London junction. The stainless-steel ribbon twists as it encircles the screen, defining a varying silhouette when seen from different viewpoints.” See video here. Not only are the traditional aesthetics of OOH changing but simply how people interact and engage with the medium. Take MediaHub and Netflix’s campaign for Altered Carbon, for example. If you aren’t familiar with this dystopian series, it operates under the premise of 300+ years in the future, people can indefinitely extend their lives by downloading their memories and experiences into new “sleeves” or bodies. Bus shelters were utilized at major intersections in West Hollywood to maximize the number of onlookers, intentionally creating a public “marketplace” for these bodies. “Through meticulous detail and a variety of in-world concepts, we were able to literally stop people in their tracks when they experienced the placements. Every campaign is different in terms of overall effectiveness, but what stood out for Altered Carbon was the fact that news of these bodies traveled beyond both the 1-to-1 interaction and cities where we bought media,” said Spenley. The limitless creative executions and continued innovation in technology with outdoor advertising suggests this is not a media that will be going away any time soon. According to a recent report from the Outdoor Advertising Association of America, OOH revenue hit $4.17 billion by the end of 2nd Quarter this year. 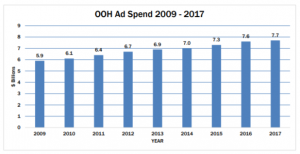 OOH ad revenue has seen consistent growth over 31 consecutive quarters reaching a record $7.7 billion in ad revenue in 2017, up 1.2% from the previous year. It is projected that 2018 will see a 2.1% growth rate YoY. Data from Nielsen’s Activation Survey reported that 5 in 10 U.S residents 18+ (46%) have utilized a search engine after seeing or hearing something advertised on an outdoor advertising unit – 4 in 10 visiting or posting on a Facebook page. When looking at how OOH indexes against online activations related to media spend, it over-performs in every category. In the below example, OOH accounts for 22% of search activations but only 7% of the media ad spend; therefore 335 represents the activation index. This continues across the additional online activations where the index value is greater than three times the expected rate, solidifying OOH as not only extremely effective, but highly cost efficient.